Sweet Bamboo is the vivid and absorbing memoir of a Chinese American family who lived in Los Angeles since the first years of the twentieth century. 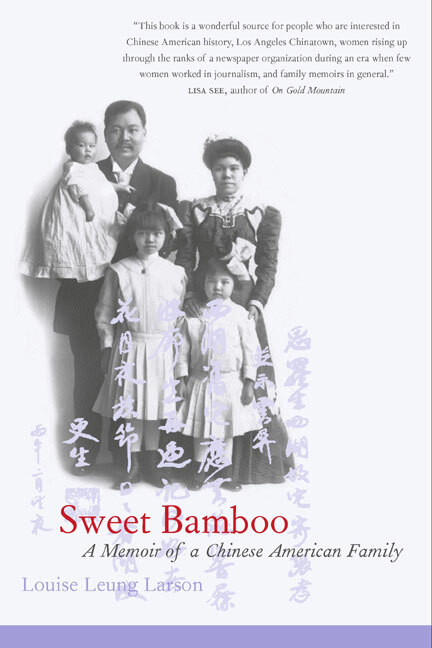 Lovingly recounted by the second daughter, who went on to become the first Asian American reporter for a major American newspaper, this account illuminates the many changes that occurred in the family as members increasingly became integrated into American society. While much of the attention given to Chinese immigrants has focused on the struggles of working class people, this book sheds new light on a different kind of immigrant experience—that of privileged Chinese parents and their children living in relative affluence in a predominantly white neighborhood. The family saga begins in China's Kwangtung Province, in the village of Gum Jook (Sweet Bamboo), about 31 miles south of Canton. It follows Louise Leung Larson's parents through their arranged marriage in 1898, to their arrival in Los Angeles, the birth of three daughters and five sons (named after American presidents), and her father's development of a successful herbalist business. Larson's intimate portrait of her family, her lively depiction of Los Angeles at the turn of the century, and her engaging descriptions of meals eaten, holidays celebrated, school events, visits from relatives, and much more make this a richly textured excursion into the dreams and disappointments of everyday life. The death of the author's mother in 1957 marks the end of an era for the Tom Leung family. An epilogue brings the story to the late 1980s, tracing the intermarriage of the third and fourth generations, and the family's diminishing sense of its Chinese identity. A postscript by the author's daughter, Jane Leung Larson, provides details of the fourth and fifth generations Leungs and recounts Jane's trip to China where she visited her parents' birthplaces and met relatives from both her grandmother's and grandfather's families. Taken together, these keen observations illustrate several generations' adaptation to dual cultures and the formation of a unique Chinese American sensibility. Louise Leung Larson (1905-1988) became the first Asian American reporter for a major American newspaper, the Los Angeles Record, in 1926 at the age of 21. She later wrote for the Los Angeles Times Sunday Magazine, Los Angeles Daily News, San Francisco News, Chicago Daily Times, and Santa Monica Evening Outlook.